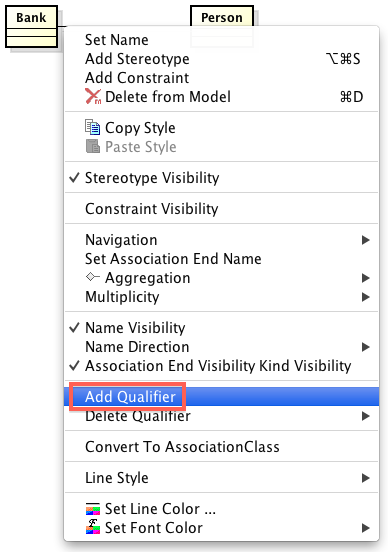 How do I model a qualified association? Below is an example of qualified association from ﻿UML Superstructure Specification, v2.1.2 (P.129) and I will show you how to create a qualified association like this example. 1) Create two Classes, Bank and Person and draw an association line between. So this is how you create a qualified association. The example has multiplicities on both classes, so lets add multiplicities. Select [Multiplicity] on the Pop-up Menu just like you opened at step 2 and choose one from the list for each class.